Sometimes the best way to learn how to do something the right way is to read stories about how others have done it wrong. If you are planning a Massachusetts wedding reception at a South Coast reception hall, it pays to be organized. The more organized that you are from the very beginning, the smoother things will go when you finally get to the MA wedding and banquet facility on your special day. While no wedding will go perfectly according to plan, when you know what you want and how you want to accomplish it, it will be easier to bounce back from any setbacks or problems. Even if you are hosting your Swansea wedding reception indoors, you will still want to make sure that you have a plan B in place if the weather turns sour. Check with the venue to see if they offer valet services and a covered entrance so guests can arrive dry to your celebration. Having a “plan B” in place for inclement weather or no-show vendors will help you to keep your cool and have fun at your Southeastern Massachusetts wedding reception. Create a wedding “playlist” on your iPhone or mp3 player that can be used in case the DJ or band doesn’t show up or is late arriving at the MA wedding and banquet facility. 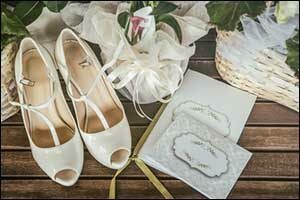 Be prepared with extra slip-on shoes in your wedding colors in case one of your bridesmaids breaks a heel or forgets to bring hers – anything you can think of to provide a “backup” for your wedding day will be helpful in a pinch. One your wedding day, make sure that your plans for the ceremony and Swansea wedding reception are strategically timed around the “golden” photo hour. Sunset is considered by photographers to be the best light for wedding photos, so work with your photographer to ensure that you are available for couple shots around that time. Even if you don’t have time to do all of the wedding party photos at sunset, at least reserve the golden hour for you and your new spouse. Another lighting area that couples often overlook is the lighting at the MA wedding and banquet facility. Contact our team of on-site event coordinators to go over your options for our South Coast reception hall. We can provide spotlight, mood light, uplighting, and other strategic lighting opportunities to help highlight all of the areas throughout the venue for your special day. You’ll want to have good lighting for cutting the cake, getting photos of the best man’s toast, and of course, the father-daughter dance. Discuss all of your staging ideas with our team when you visit our Massachusetts wedding reception hall so we can provide you with solutions for all of your lighting needs. Find out if your guests have food allergies or restrictions by including a line for this option in your RSVP. That way, you can let the caterer know ahead of time and match the preferences to the table number for that particular guest. It will help prevent accidental exposure to anything from dairy or gluten to tree nuts, peanuts, or other common food issues. Work with the South Coast reception hall to ensure that you have non-allergen options in your menu. Venus de Milo has a wide range of menu options that can be used to ensure that there aren’t any food issues with your guests. If you have never planned a Southeastern Massachusetts wedding reception before, you might not be aware that you need to add yourself, your new spouse, and your wedding party into the catering order for the final numbers. Many couples assume that the venue already knows to count them, but unless you include all of these people in your totals, you will be short on food. Also, make sure to order vendor meals for any vendors that will be on-site, including the wedding planner, DJ, band members, photographer, and the photo booth operator. Go over your list of vendors to make sure that everyone is included in the count. Another common mistake is to not actually visit the South Coast reception hall yourself before the wedding. Don’t just look at photos or take someone’s word for what you can expect. You need to schedule a tour of our Swansea wedding reception facility so you can see how much space you’ll have, work on staging details, and have an idea of where everything will be situated during the celebration. Give us a call at 508-678-3901 to schedule a tour or to speak with one of our on-site event coordinators about your event at our MA wedding and banquet facility.